The Society will hold its Annual General Meeting at Glebe Town Hall, St Johns Rd Glebe, on Sunday 19 August at 11am. All financial members are welcome to attend and to participate in the election of the Society’s office bearers for the coming year. 2019 will be a particularly important year for the Society, marking its 50th anniversary with an exhibition and a celebration of its achievements. The work of the Society is carried out by the Management Committee and its Subcommittees and I want to put on record my gratitude for their hard work and creative contribution to the benefit of the Glebe community. In this Bulletin (page 11) and in the next edition, the convenors of our subcommittees will report on their activities over the past year, and I’m hoping those reports will enthuse all of our members to consider taking a more active role in the Society’s affairs. There are many opportunities for members to contribute to the work of the Society. No election is required to become a member of any of our subcommittees; all that’s required is an indication of interest and a desire to be involved. Whether it’s the local environment, heritage, community development, planning approvals, communications, transport and traffic, or Society events, your input will be welcome. Most subcommittees meet on a monthly basis, so the workload need not be onerous. Office bearers of the Society and other members of the Management Committee will be elected at the AGM and members are encouraged to consider standing for these positions. The Society’s constitution prohibits me from standing again for President, and I’m hoping that the challenges and privileges of the position will attract at least one energetic nominee. Other positions open for election are Vice-President, Treasurer and Secretary, as well as five other Management Committee member positions. Nominations will close on Sunday 12 August at 11am. A nomination form (.pdf) nomination form can be downloaded here. Nomination forms must be signed by two members of the Society and must include the written consent of the candidate. The guest speaker at this year’s AGM will be Councillor Philip Thalis who was elected to the City of Sydney Council in 2016. He and his life partner, Sarah Hill, started their company Hill Thalis Architecture + Urban Partners in 1992, and were the winning team of an international competition to design the space at the western edge of Sydney’s central business district now known as Barangaroo. That plan called for the whole foreshore to be inalienable public land, but as we now know the Crown casino put an end to that. 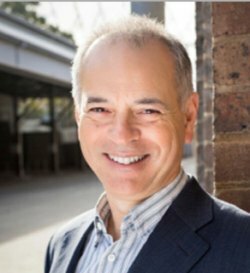 The pace of change within the City prompted Philip Thalis to stand with Clover Moore’s team and to take a more public stand on development and planning issues. He believes architects and other professionals have ‘basically left the field to the spruikers of development interests.’ He says, ‘the development interests are so vocal, and the professionals are so timid to speak up in the public interest because they are perhaps too worried about their job, their reputation’. I’m sure Councillor Thalis will speak forcefully about how he defines the public interest in the current Sydney era. It promises to be an interesting AGM.